Robot collectors, kids and adults are gone love this robot. 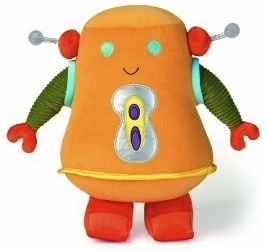 The plush Beep Bots Twir robot is a cute and adorable robot that loves to cuddle. Manhanttan Toy makes quality toys that are adored by kids around the globe and this robot isn’t any different. The bright colors are gone speak to your kids and the quality of the product is gone speak to you. A great gift for a kid or a robot collector. Who ever you are of the two go and look at this Beep Bots Twir Plush Robot.